I did not see in any of the reviews of filter systems, the chloramine removal, which is now used instead of chlorine in our municipal water. Filters that remove chlorine do not necessarily remove chloramine. I am in search of a whole house filter system that will remove chloramine, as it is as important to remove it from shower water as drinking water. Thank you for your question as I have wanted to address this question about whole house systems that are effective for the removal of chloramine. You are right, filtration media often used to remove chlorine does not necessarily remove chloramine. It is one of those contaminants that requires a specific filter media. The Pelican Water System company guarantees the removal of chlorine and chloramines for 5 years on their whole house water systems. All of their whole house systems remove chloramines to non-detectable levels, as well as many other contaminants. Crystal Quest also has whole house systems that effectively remove both chlorine and chloramines. In addition, they provide a balanced pH water. The Crystal Quest SMART series whole house systems have Catalytic GAC, which is an effective filtration media for removal of chlorine and chloramine. 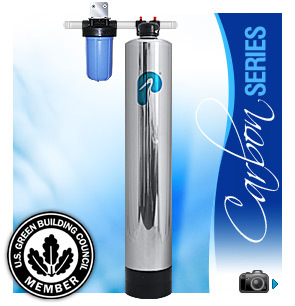 Crystal Quest is also good at customizing water systems for specific filtration and water quality needs. In general, the specific whole house system you choose (regardless of the manufacturer) depends on the specific contaminants you want to remove from your water, the size of your house, the number of bathrooms and how many people are in your family. The flow rate is also important. Many companies also offer whole house systems that offer either manual or automatic back washing. We highly recommend the automatic back washing over the manual ones as they require less maintenance.